With Google’s ubiquity, seeing what people search for is quite telling. You can easily find what the hottest topics are, which terms are trending, and gain insight into the minds of internet users. 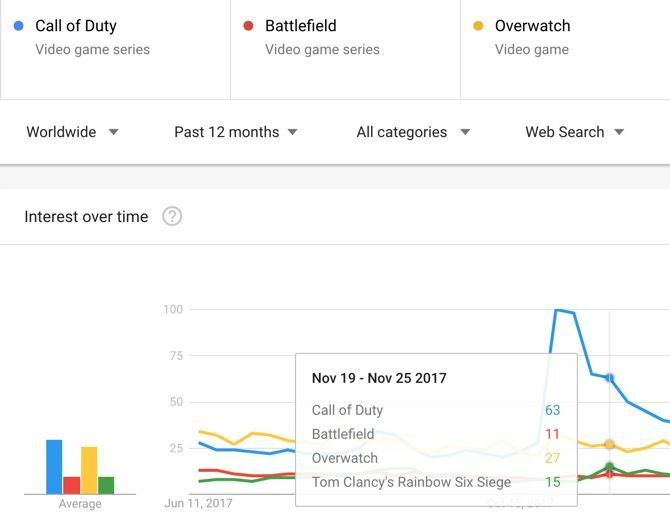 Google actually provides a powerful tool called Google Trends that lets you access and filter through this information with ease. Let’s take a look at the latest version of Trends and see how it can be useful for you. On the Google Trends homepage, you’ll see some starter examples of topics to explore. 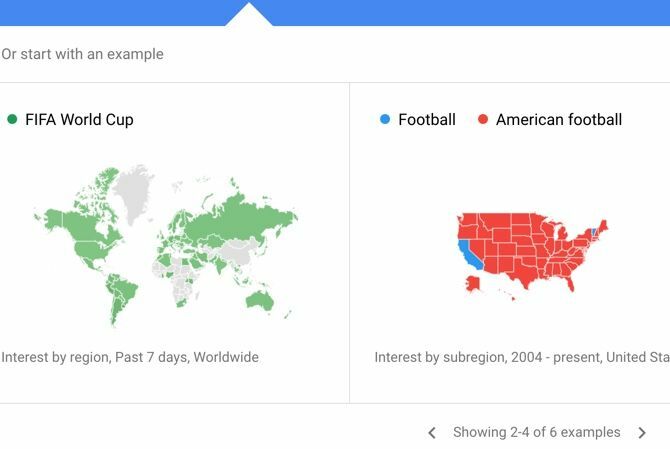 At the time of writing, these include interest in the FIFA World Cup by region in the past week and interest in the word “cupcake” worldwide since 2004. Continue scrolling down, and you’ll see trends inspired by new stories. These include interest in Mother’s Day activities or search volume for teams in the NBA finals by state. Further on the page, Google collects recent trends. This is a great way to see what topics people have searched for in droves lately. Near the bottom of the page, you’ll find the neat Year in Search archives. In these, you can find the most popular terms of the year on Google in a variety of categories, like car models, dog breeds, games, and GIFs. 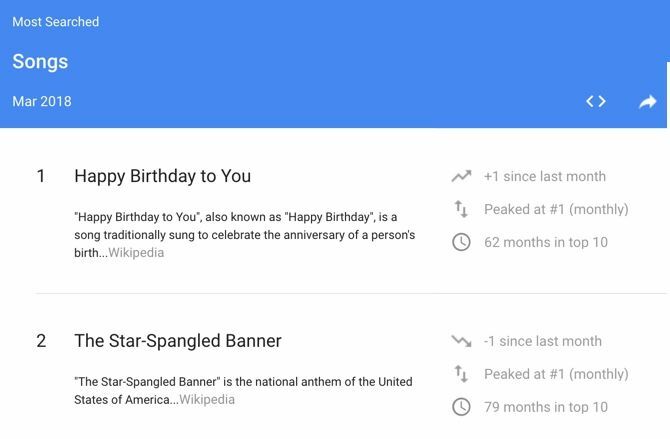 Google also shows an overview of the year’s biggest stories through search. That’s just the homepage, though. Google Trends is capable of a lot more. The service really shines when you use it to research something you’re interested in. Enter a search term into the top bar, and you’ll see detailed trends for it. 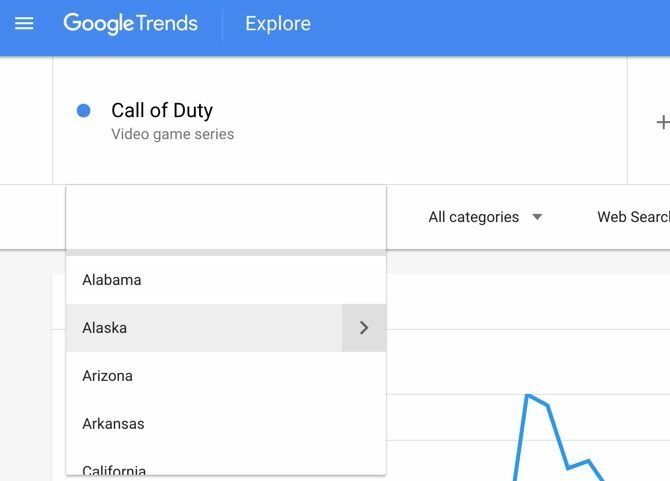 Depending on what you enter, Google Trends considers it either a search term or topic. 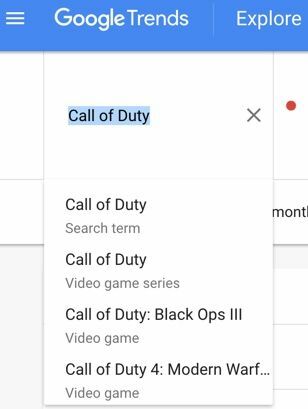 For example, if you type Call of Duty, you can choose the generic Search term entry or the more specific Video game series. On Google’s comparison help page, it mentions that search terms show matches for all terms in the given language, while topics are groups of terms across languages. So if you use Washington D.C. as a topic, it will include searches for United States capital and equivalents in other languages. But Washington D.C. as a term will also include partial matches like Washington Nationals, for instance. Once you enter a search term, you can set a variety of criteria underneath it. Use the first box to set the region of search. You can choose Worldwide to see everywhere or drill it down to specific regions of a country. For instance, under United States, you can select a state like Virginia to see only information for that area. The second dropdown lets you choose the time frame. The default is Past 12 months, but you can select as recently as the past hour or as far back as 2004. This lets you see trends over years as well as how a term’s popularity has risen or fallen in the short-term. Change the All categories box if you want to search in a specific area like Books & Literature. Usually, you can leave this on All categories unless a term has multiple meanings. Finally, you can change the default Web Search to Image, News, Shopping, or even YouTube Search to see trends on those Google sub-sites. Once you’ve set your criteria, you’re ready to check out the results! On the search results page, you’ll see several data visualizations of what you searched for. One is an Interest over time graph, which charts interest on a relative scale of 0-100 for the time period you’ve chosen. The Interest by subregion lets you see a heatmap of which states, countries, or regions search for the topic most. Mouse around on either of these to see search breakdowns. At the bottom, you’ll find related queries and topics. This is interesting on its own, but Google Trends really shines when you use it to compare topics. At the top of the results page, click Compare to add another topic. You can compare up to five terms. Once you add more, you’ll see them color-coded throughout the page. The region breakdown shows you which areas search most for what topics, and the breakdown among them. It’s a really neat way to see what people think of competing topics. To drill down even deeper, click the three-button Menu on a search term and choose Change filters. This lets you edit the region or time period for one item. You could use this to see how interest for MacBooks in Australia compares to worldwide interest in Computers, to take a random example. You can have a lot of fun playing with the Explore features above, but Google Trends reveals more. Open the left slide-out menu and choose Trending Searches to see what the world is looking for. This page holds the top searches in your area per day, along with their search volume and related news stories. Use the dropdown below the search box to look at a different region. If you’re interested in keeping up with social trends, you can also get email notifications for trending topics. Click the Envelope icon in the top-right of the Daily Search Trends tab to get periodic emails about the biggest topics. You can also subscribe via RSS. Switch to the Realtime Search Trends tab at the top to see terms that have quickly taken off in popularity. Also on the left sidebar, the Top Charts tab lets you see the trending (and most-searched, through a dropdown) terms in all sorts of categories. These include Animals, Authors, Movies, Songs, and much more. Click a category box to see a breakdown of the list, including links to Wikipedia, stats on its popularity, and a quick link to explore it further on Trends. Like elsewhere on Google Trends, you can use the criteria boxes at the top to change your specified region, time period, and categories. 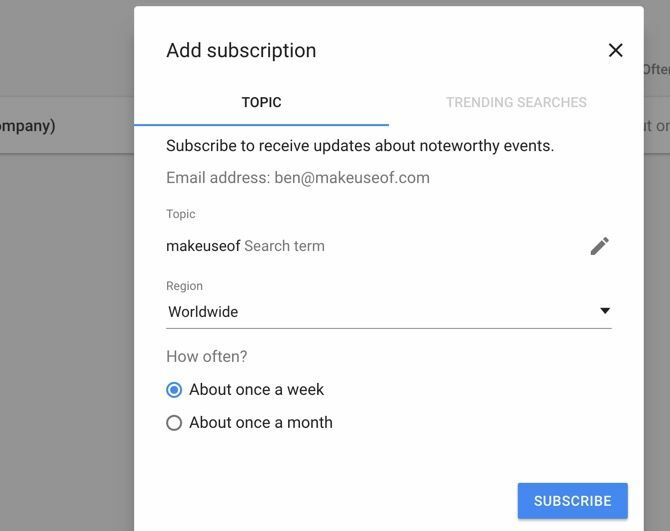 The Trending Searches tab lets you sign up for notifications about hot topics, but the Subscriptions tab lets you subscribe to any term you like. Just click the Plus icon in the bottom-right corner. Enter a search term or topic you’re interested in, set the region, and specify whether you’d like updates once a week or once a month. If you want regular updates on how a particular term performs but don’t want to check Trends manually, this is a convenient option. 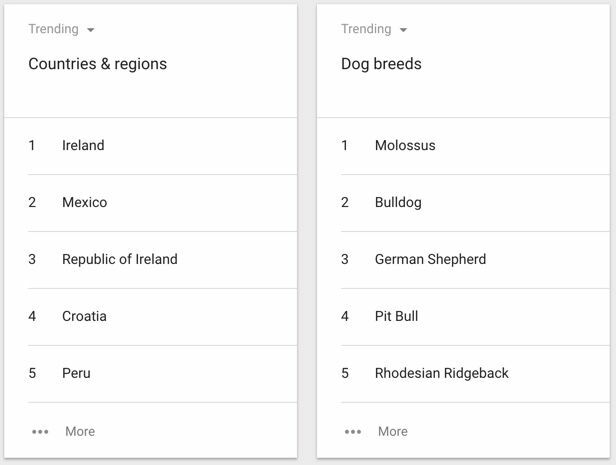 We’ve seen what Google Trends offers to those who wonder what’s trending on Google. Whether you just want to peruse the latest trends or dig into detailed comparisons with data visualization, there’s something here for everyone. It’s fascinating to see what the world searches for. 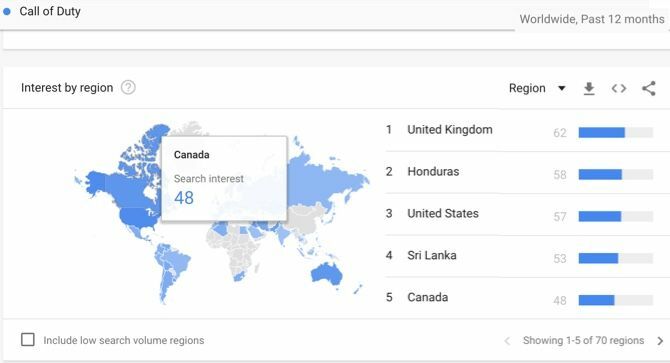 What will you discover with Google Trends? For more, check out the most popular “OK Google” questions people ask.